Since this article first appeared, two new places have opened across from the Park that we recommend you consider in your picnic plans; Pret a Manger for terrific organic sandwiches and Crumbs for the most delectable cupcakes in a wide variety of flavors. Bryant Park on 42nd Street behind the New York Public Library has long been a lunchtime refuge for corporate employees working in the area and students from the State University of New York School of Optometry across the street. Years ago, from my office in the AT&T Building (now Met Life) on the Avenue of the Americas, I looked down upon the park and realized the geometrically laid out spaces for grass and trees were deliberately designed to compliment the architecture of the Library. From my high vantage point, it was immediately evident that the early 20th century building was planned to replicate an Italian Renaissance or Baroque Palazzo (Palace) with the requisite landscaped garden to provide a pastoral retreat from city life. The park's tranquil beauty, café umbrellas, comfortable chairs and tables, make it an ideal location for a picnic. Invite a friend to meet you for lunch or after work for a short visit. You can pick up everything you need close-by. Select a bottle of chilled wine from a wide variety at Park Ave Wines and Spirits, 292 Madison Avenue, between 40th and 41st. Then, stop by Zeytinz, direcly across from the Park on 40th St, for fruit, crackers, sandwiches, breadsticks and of course, cheese. One nice touch, they have a place where you can wash the fresh fruit. This Monday evening the HBO sponsored Summer Film Festival begins and the Park becomes the “place to be." Thousands of New Yorker's with picnic baskets and hampers in all shapes and sizes will be there to eat, lounge on the grass and toast glasses of wine. Get there early to secure a spot as the festival kicks off with those two cunning hearttrobs Robert Redford and Paul Newman in "The Sting." Other popular classics on the menu this summer include: "Dog Day Afternoon," "Kramer vs Kramer" and "Close Encounters of the Third Kind." 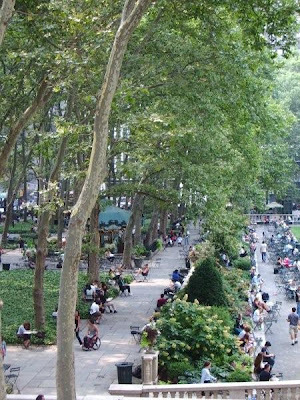 Click here for dates and check out the many events from Yoga and Tai Chi, knitting, poetry readings and jazz concerts that keep Bryant Park abuzz with activity from early morning to late at night. Never again, waste your precious time (even more valuable if you are on vacation and wish to cover as much ground as possible) or arrive somewhere only to discover it is CLOSED! If you’ re interested in making the most of your valuable time, why waste it checking through websites, telephone books or asking directions to popular attractions when you can have it all at a moments glance with New York Get There 1-2-3? Discover great places to enjoy with kids open everyday of the year. free and pay as you wish days. Addresses to remember: Bryant Park, 42nd Street and Avenue of the Americas. Visit web site to learn more about the parks beautiful flower arrangements, events like free tai chi classes, music and dance performances, poetry and book readings http://www.bryantpark.org/. Zeytinz, 24 West 40th Street,http://www.zeytinz.com/, 212-575-8080. Park Ave Wine and Spirits, 292 Madison Avenue, between 40 and 41st Street, 212-685-2442, http://www.parkaveliquor.com/. Directions: From Times Square MTA A, E, C, 1, 2, 3, 7, S, R, N, Q a short walk to Avenue of the Americas. If you like today's issue, why not become a subscriber to Postcards from New York? To start receiving your own copy of Postcards, click here. Or, forward this e-mail to a friend so they can sign-up to receive Postcards from New York too. © Copyright 2007-9 The Cable Group.